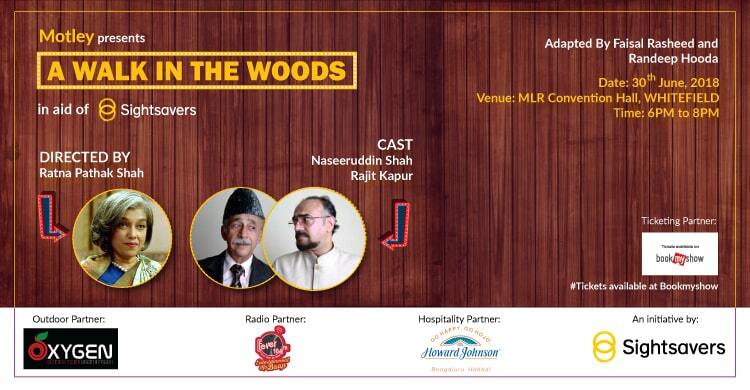 Sightsavers India brought the renowned play ‘A Walk in the Woods’, directed by Ratna Pathak Shah, for the Indian audiences in Bangalore on June 30th, 2018. The Indian adaptation of the play by Lee Blessing featured Naseeruddin Shah and Rajit Kapur as a Pakistani and an Indian diplomat who meet in Geneva to discuss a proposal that might ease the tension between the two countries and carve a peaceful and progressive way forward. By organizing this event, Sightsavers aims to raise money to help the people with visual impairment and other disabilities. As part of Sightsavers commitment towards the local communities, the proceeds from the ticket sales will be contributed to Sightsavers programs that cater to people with visual impairments, disabilities and children in the marginalized communities. Sightsavers purpose is to prevent avoidable blindness and fight for disability rights in a responsible way.